International Battle of the Bands Official Certificate for The Tropics, a Tampa-based band. 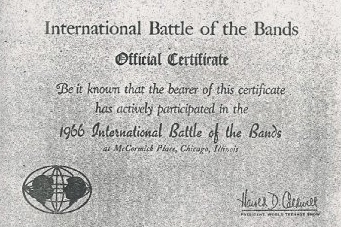 The certificate proclaims, "Be it known that the bearer of this certificate has actively participated in the 1966 International Battle of the Bands at McCormick Place, Chicago, Illinois." McCormick Place is located at 2301 South Martin Luther King Drive. Original certificate, 1966: Profiles: Bands & Artists, Tampa Bay Music Scene Historical Society. Digital reproduction of original certificate, 1966. http://www.tampabaymusichistory.com/resources/15743_218662622836_215085887836_4195577_2735513_n.jpg. 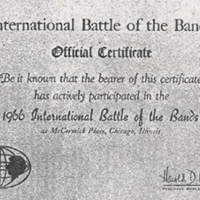 “International Battle of the Bands Official Certificate.” RICHES of Central Florida accessed April 19, 2019, https://richesmi.cah.ucf.edu/omeka/items/show/5457.